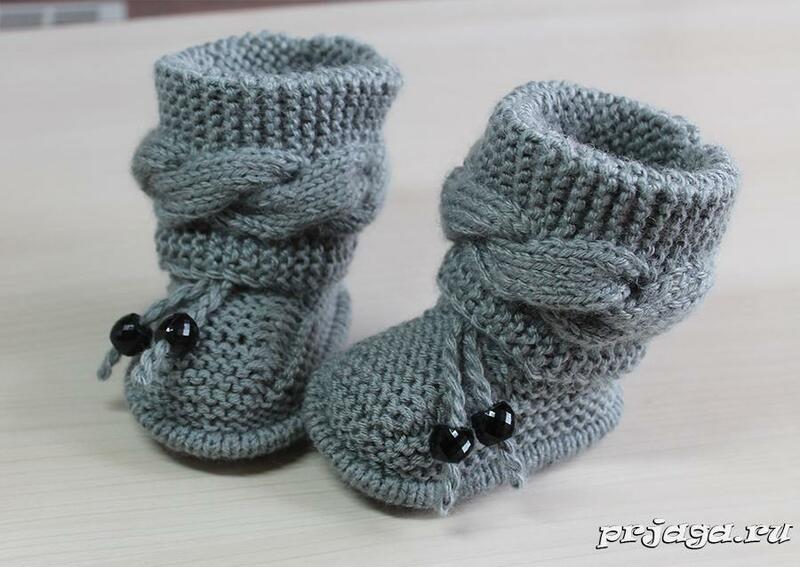 Interesting model booties knitting, won the hearts of young mommies. prepared for the site prjaga.ru, do not transfer to other sites, personal diaries or social groups. networks! Materials: Gazzal Baby Wool XL yarn (40% merino, 40% acrylic, 20% nylon, 50 g / 100 m.), Needles 4.0 mm. Knitting density: 21 loops = 10 cm. 1st row (external side): chrome. loop, face loops, chrome. a loop. 2nd row (front side): chrome. loop, 1 faces., add a loop to the left, 15 faces., add a loop to the right, 2 faces., add a loop to the left, 15 faces., add a loop to the right, 1 faces., chrome. a loop. 3rd row: chrome. loop, face loops, chrome. a loop. 4th row: chrome. loop, 2 faces., add a loop to the left, 15 faces., add a loop to the right, 4 faces., add a loop to the left, 15 faces., add a loop to the right, 2 faces., chrome. a loop. 5th row: chrome. loop, face loops, chrome. a loop. 6th row: chrome. loop, 3 faces., add a loop to the left, 15 faces., add a loop to the right, 6 faces., add a loop to the left, 15 faces., add a loop to the right, 3 faces., chrome. a loop. 7th row: chrome. loop, face loops, chrome. a loop. 8th row: chrome. loop, 4 faces., add a loop to the left, 15 faces., add a loop to the right, 8 faces., add a loop to the left, 15 faces., add a loop to the right, 4 faces., chrome. a loop. 9th row: chrome. loop, face loops, chrome. loop = 52 loops. From the wrong side with an additional thread, lift 50 loops along the 10th row (or the 1st row of the front smooth surface). 16th row: chrome. loop, * remove the loop from the working needles, knit loops with add. Spokes faces., Throw the removed loop on the knit, repeat from *, chrome. loop = 52 loops. 17-21 rows: knit facial loops (handkerchief). 1st row (front side): chrome. loop, 28 faces., 2 together izn., turn the work. 2nd row (external side): remove the loop, 6 faces., 2 faces together. left, turn the work. 3rd row: remove the loop, 6 persons., 2 ws., Turn the work. 4th row: remove the loop, 6 persons., 2 persons together. left, turn the work. 5-18 rows: repeat 3-4 rows 7 more times = 34 loops on the needles. 19th row (front side): remove the loop, knit the front ones to the end of the row, chrome. a loop. 20th row (external side): chrome. loop, knit facial to end of row, chrome. a loop. 21st row (front side): chrome. loop, knit facial to end of row, chrome. a loop. 22nd row (from the side, button holes): chrome. loop, * 2 together izn., nakid, repeat from *, chrome. a loop. 23rd row (front side): Krom. loop, knit facial to end of row, chrome. a loop. 24th row (external side): chrome. loop, knit facial to end of row, chrome. a loop. 1st row ( front side): chrome. loop, 5 out., 22 faces., Krom. a loop. 2nd row (external side): chrome. loop, 4 persons., 12 ex., 6 persons., 5 ex., Krom. a loop. 3-6 rows: repeat 1-2 rows. 7th row: chrome. loop, 5 out., 6 faces., remove 6 loops for extra. knitting needle before knitting, 6 persons. with left knitting needles, knit 6 faces. with add. Spokes, 4 persons., Krom. a loop. 8th row: chrome. loop, 4 persons., 12 ex., 6 persons., 5 ex., Krom. a loop. 9-12 rows: repeat 1-2 rows. Then repeat 1-12 rows 5 more times (or 6 times in total). 1. Wrap the upper edge of the cuff in the inside. side and hem. 2. Hem the cuff over the base of the bootie so that it covers the openwork row. 3. Sew the back seam and the seam on the sole. Make a tie and insert into the openwork row. Materials: yarn Gazzal Baby Wool XL (40% Merino, 40% Acrylic, 20% Nylon, 50 grams/ 100 meters), Needles 4.0 mm. Gauge: 21 sts = 10 cm. Row 1(WS): edge st., knit sts to 1 st., edge st.
Row 2 (RS): edge st., k1, ML, k15, MR, k2, ML, k15, MR, k1, edge st.
Row 4: edge st., k2, ML, k15, MR, k4, ML, k15, MR, k2, edge st.
Row 6: edge st., k3, ML, k15, MR, k6, ML, k15, MR, k3, edge st.
Row 8: edge st., k4, ML, k15, MR, k8, ML, k15, MR, k4, edge st.
Row 9: edge st., knit sts to 1 st. edge st. = 52 sts. Row 16 (RS): edge st., *slip 1 from left needle, knit 1 from dpn, pass slipped stitch over, repeat from *,edge st. = 52 sts. Row 1 (RS): edge st., k28, p2togturn. Row 2 (WS): slip 1, k6, sskturn. Row 3: slip 1, k6, p2tog, turn. Row 4: slip 1, k6, sskturn. Rows 19 (RS): slip 1, knit sts to 1 st. edge st. Rows 20 (WS): edge st., knit sts to 1 st. edge st. Rows 21 (RS): edge st., knit sts to 1 st. edge st. Rows 22(WS): edge st,*p2tog, yo, repeat from * to 1 st, edge st. Rows 23 (RS): slip 1, knit sts to 1 st. edge st. Rows 24 (WS): edge st., knit sts to 1 st. edge st.
Сuff: cast on 29 stitches. Row 1 (RS): edge st., P5, k22, edge st.
Row 2 (WS): edge st., K4, p12, k6, p5, edge st. Rows 3-6: repeat rows 1-2. Row 7 (RS): edge st., P5, k6, cable (slip 6 next stitches to dpn and hold on, then knit 6 from dpn), k4, edge st.
Row 8: edge st., K4, p12, k6, p5, edge st. Rows 9-12: repeat rows 1-2. Repeat rows 1-12 - 5 more times.